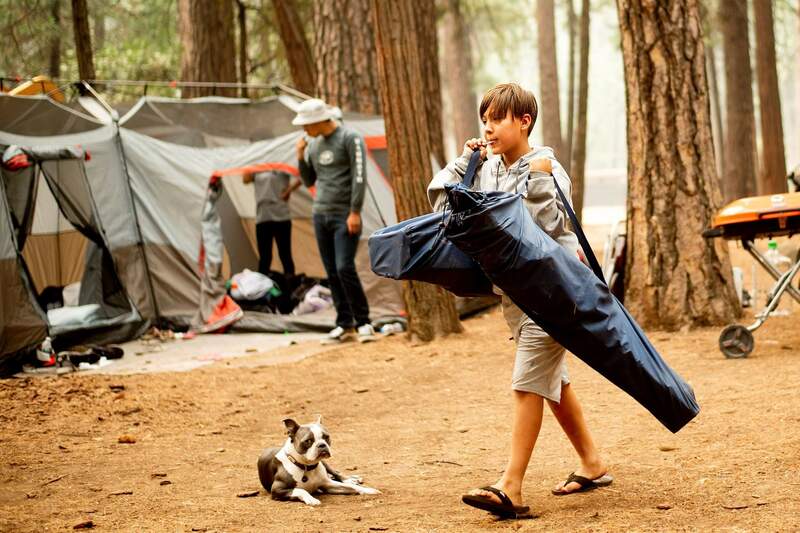 River Martinez, 10, breaks camp at the Upper Pines Campground in Yosemite National Park, Calif., on July 25, 2018. Martinez’s family, visiting from Los Angeles, had to cut their stay short as portions of Yosemite close today to allow crews to battle the Ferguson Fire burning nearby. YOSEMITE NATIONAL PARK, Calif. – As smoke from a nearby wildfire pours into Yosemite Valley, Tom Lambert has had to tell tourists who booked his vacation home months in advance that they would have to defer their dream stays so firefighters could take protective measures against the growing blaze. “We had one guest who planned a weeklong trip,” Lambert said. “It was a father-daughter trip, for her high school graduation ... Now it’s done. It’s sad.” Another guest had to delay plans to climb Half Dome. 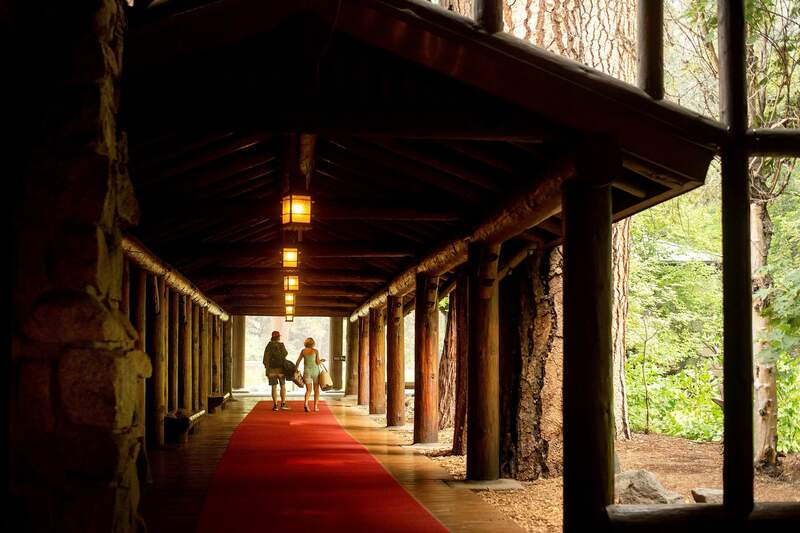 Guests leave the The Majestic Yosemite Hotel‎, formerly The Ahwahnee Hotel, shortly after it closed on July 25, 2018, in Yosemite National Park, Calif. The hotel, nearby campgrounds and other sections of Yosemite close as firefighters work to contain the Ferguson Fire. Officials emphasized that Yosemite wasn’t under imminent danger from the fire. Authorities decided on the shutdown to allow crews to perform protective measures such as burning away brush along roadways without having to deal with traffic in the park that welcomes 4 million visitors annually. 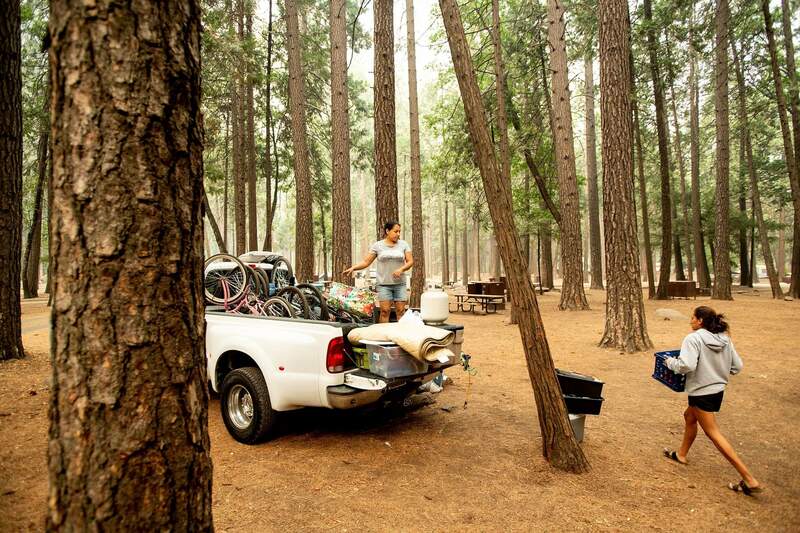 Lisa Salgado and daughter Alyssa, 19, break camp at the Upper Pines Campground in Yosemite National Park, Calif., on July 25, 2018. Salgado’s family, visiting from Los Angeles, had to cut their stay short as portions of Yosemite close today to allow crews to battle the Ferguson Fire burning nearby. At least 1,000 campground and hotel bookings were canceled – to say nothing of the impact on day visitors, park workers and small businesses along the highway, Gediman said. Rangers went to campsites one at a time to inform visitors of the closures. Hotels guests got phone calls and notes on their doors. Miguel Martinez breaks camp at the Upper Pines Campground in Yosemite National Park, Calif., on July 25, 2018. Martinez and his family had to cut their stay short as portions of Yosemite close today to allow crews to battle the Ferguson Fire burning nearby. 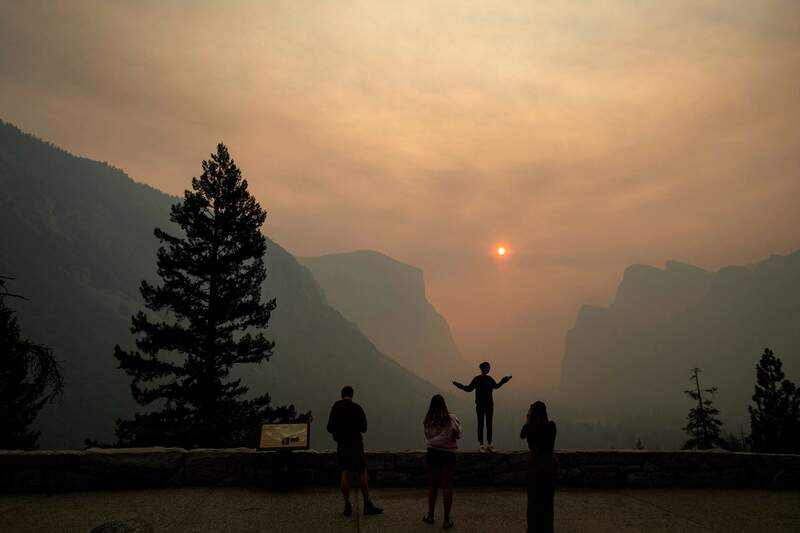 Hannah Whyatt poses for a friend’s photo as smoke from the Ferguson Fire fills Yosemite Valley on July 25, 2018, in Yosemite National Park, Calif.
“People are heartbroken,” she said. “Some want to ride it out for a few days and see if they can get back in the park.” Others want help finding places to stay away from Yosemite. “There are wonderful places to visit in the region, so we’re asking people to consider alternative plans,” he said. In Southern California’s San Jacinto Mountains, a highway was closed and evacuations were ordered near the town of Idyllwild as crews tried to stop the spread of an out-of-control wildfire. In the state’s far north, a 7-square-mile wildfire has forced the evacuation of French Gulch, a small Shasta County community that dates to the Gold Rush. Berger reported from Yosemite; Weber from Los Angeles. AP reporter John Antczak in Los Angeles contributed.